Jason Statham, 38, has been called Britain’s most bankable star and one of its most valuable exports, in worldwide cinemas anyway. He first found fame, a lower-grade version anyway, as a champion diver and even represented Britain in the 1988 Olympic Games. He then became a model, street-seller and eventually, by accident or universal design, an actor in Guy Ritchie’s fresh, frenetic 1998 hit, Lock, Stock and Two Smoking Barrels. This brash handsome neophyte almost stole the show. No wonder then that by 2002, visionary French writer, director and producer Luc Besson had cast him as a new era of delivery man in The Transporter, a worldwide hit which spawned a trilogy and effectively crowned Hollywood’s new action king. Many films and rather more substantial fame later, Statham is Arthur Bishop, a brilliant, reclusive hit-man with a different kind of heart in acclaimed British director Simon West’s new film The Mechanic. You’ve said you want to move towards more quality films. Is The Mechanic one of them? I think it's definitely moving in a direction that I want to be moving in, yes. It's a little more interesting to play this kind of a character than some of the other roles I've done, and now I'm getting to work with more experienced producers and more experienced directors, like Simon West. And of course actors of great quality like Ben Foster [Statham’s Mechanic sidekick]. I think once you get a good screenplay, everything else about a film gets raised in some way. That's the driving force for me - to work with better people, doing better things, and having better scripts. This is certainly something going in the right direction. What makes you pick a film? Gut instinct mostly. That and your intuition are the best things. You have to like the script and be involved with a director you think can steer the ship and keep it off the rocks. That’s a very important thing. [Director] Simon West comes with so much experience so it’s not like you have to make any second guesses that he’s going to know what he’s doing. I’ve worked with first-time directors and they seem cool but sometimes you go, “Am I doing the right thing? Does he know what he’s doing?” I was so pleased Simon was going to do an action film and I was going to be in it. And as soon as they told me they were trying to cast Ben Foster opposite me, I thought, “This is a no-brainer”. Is there any sort of British “stamp” on the film given that you and Simon are both Brits? I am a British guy in essentially an American film but I don’t think people really care too much about that although Simon and I are certainly the ones kicking this through. There’s a big British influence. That’s why it’s good. There’s a shorthand with anyone from the UK - you speak the language, the humour’s there. And I tend to work better when I can have a bit of a giggle. Simon supplied that and it takes the pressure off. When something’s good, it just feels easy. And we never take ourselves too seriously. I think that’s a great aspect of the Brits. We’re always laughing at ourselves. Were you already a fan of Ben Foster’s work? Oh yes. He’s great. He’s a real quality actor so for me to be able to work opposite someone like that and not some hairdresser cast off the street - which is what happened with Transporter 3 - well, it was fantastic. The role of Bishop is incredibly physical. Can you talk about your preparation? It changes so much, depending on how injured I am. I do try to work with stunt people that I've worked with before, so we have a certain amount of know-how in terms of what we are going to do together. It wasn't like we had a ton of extensive choreography to learn for this one but I have a gym I go to that preps me. A ton of stuntmen work out there all the time so it's great to go there before I shoot a film. I try not to focus too much on dieting and losing weight unless it's really, really necessary. What about the mental side? Well I'm not a method actor, I hope you know that! I just find an ability to be able to play the roles that I do. The physical stuff is easy, the other prep comes from rehearsals and communication with the director, and that all comes whenever you get to where you are filming. What was it like filming in New Orleans? We had a great time down there. We met some great people, and made some great friends. It's the second film I've done down there. It's slightly more appealing in the wintertime than it is in the summer when it gets kind of sticky. 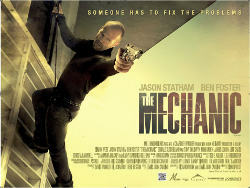 This is a remake of the 1972 version of The Mechanic starring Charles Bronson. Were you a fan of his? Of course, yeah. I've seen every film he made. That's why he’s so great. You can watch those films time and time again. I've always been a fan of Bronson’s. Did you have any reservations about tackling a character he had already made his own? Comparisons are always going to be made, and it's not the first remake I've done. I did a remake of The Italian Job years ago, and again, that was a great, classic movie that some people think should never be touched but it ended up being a decent job. And it's the same with this. A lot of people won't remember the original, or won't even have seen it. It was nearly 40 years ago. So, yeah, I don't think we are too bothered about it being a remake. Which was the most fun scene to film? I think being strung up there on the outside of this huge building with Ben [Foster] and seeing how scared he was. He was pooping himself! It makes me sound a little bit sadistic but it’s great when you do something with real excitement to it. It seems there's always so much more reward in doing something in terms of the action than a good dramatic scene. There's no one clapping for that. People might be touched by it but it’s the action stuff which produces the euphoria on set. Bishop is a huge classic car enthusiast who is restoring an E-Type Jaguar in the film. Do you share his passion? I love cars actually, yes. I’m not much of a tinkerer but I could talk all day about vintage cars and the old E-Type is a great one. I'm particularly fond of all the Jags, the old Aston Martins, the British cars, but I don't have any classics myself. They tend to break down a lot and there's always a problem with that. There's nothing reliable about an old classic but they’re so great to sit in, walk around and admire. How comfortable are you being perceived as the action man of your generation? Very comfortable I suppose, if that's what you want to call me. I'm working away and I'm very happy doing what I'm doing, and things have been going well recently. I've been working with some good people. You’ve been working as an actor for 13 years now. Can you talk about how you have developed. I think I know what I'm doing now. Just. You get to know what you're doing and there's no substitute for the experience. The more experience you have, the more you know what will work for you and what won’t. Now I have 10 years of knowing what’s good for me. A lot of the elements are not in your control but when it all comes together, and in a good way, that’s the best. There are certain things I’ve done which make me bow my head with embarrassment and I won’t mention them because there’s no point. Then there are others I’m really proud of. It’s just about reducing the percentage of ones you’re not proud of. I mean I’ve just worked opposite Robert De Niro and Clive Owen in a film called The Killer Elite so that's definitely another step in the right direction. Was it intimidating working with Robert De Niro? Very intimidating, as you can only imagine. You don't want to make a fool of yourself in front of that man. Luc Besson produced all three of the Transporter films you starred in. Do you feel he’s responsible for some of your success? Oh, he's one of the key figures for me. He was basically the first person who gave me the lead in a movie. He’s a very significant man and had a huge effect on my career. Who else has had a significant impact on you? Guy Ritchie of course. [Ritchie has directed Statham in three films, including Lock, Stock and Two Smoking Barrels.] I remember being with Guy years ago and I asked him, “Should I go and sign myself up for drama school?” I’d just done Lock Stock on a whim and his words of advice were: “There’s a fine line between intuition and technique and I think you will serve yourself much better by going on your intuition”. The words and advice of Guy Ritchie seem to stick with me. Any news on The Expendables 2? Yes, I have heard about a sequel, and I'll be the first to say yes to a phone call from Sly [Stallone]. As soon as the movie started to do really well, he said, “You know, it would be great to do this again”. And if there's anyone that can do a good sequel, it's Sly. He's done a fair amount. We had a good time and it's definitely something I'd like to repeat. And what about a third Crank film? It's a shame the second one [2009’s Crank: High Voltage] didn't do that well. The first one had a little bit more success and the second one was absolutely nuts. I don't know whether we'll do another one, I just know I had a great time working with Mark Neveldine and Brian Taylor [writers/directors]. They are absolutely mad as hatters. Do you see primarily action films in the cinema or other sorts too? I like all kinds of films. I don't have any particular favourites. I enjoy myself. I go to the cinema and watch all different kinds of films. Recently I’ve seen The Fighter and The King’s Speech and I thought they were both terrific. Very good indeed. Did The King’s Speech make the hard man cry? I do get teary you know. There’s a lot of films I get teary in. Another good film I saw that did make me get teary was Blue Valentine. I did cry in that. I was welling up in The King’s Speech but we watched that with a lot of people and I was trying to stay tough. But it’s so powerful. I like to relax and spend it with people that I've grown up with, people that I care about. I’m happy to just sit around, doing nothing. On a beach is fine. Not so much. All my friends are. I'm not as big a soccer fan as people might imagine, being British. You were on the British Olympic diving team when you were younger. Do you still follow diving? No, it's probably the smallest sport in the world. It’s not even follow-able. Literally, as soon as I retired from diving, I had no interest in it. How did you get to become a champion diver anyway? I tried it and then within a year I was on the British team. All of a sudden you are travelling around the world competing, and there's a certain aspect of that which is very appealing to a young man. The next thing you know, you click your fingers, you turn around and 12 years have gone by! Did your diving career help with this markedly different one? It was very good for me to do that in terms of what I'm doing now because a lot of the training was about gaining aerial awareness. If you’re doing a lot of stunts, you need a great sense of distance and timing so a lot of the tumbling and trampolining I used to do has paid huge dividends. What do you have coming up, work-wise? This is the first period in several years where for the next few months I'm not doing anything. The last three years, I’ve always had something in front of me. Now I'm just waiting for The Expendables 2. Dropping down two or three gears and just breathing for a few months. I did go back to Britain at Christmas and saw everyone but it’s the wrong time of year to go. It’s hectic and it was too much. I think I will get to go back and see someone I want to see and didn’t get to see, and all the people I hold close. I’ll do that in the next couple of months. Recharge! Get to the spa! Get my nails done! Arthur Bishop (Jason Statham) is the 'mechanic' - an elite assassin with a unique talent for eliminating targets with deadly skill and total emotional detachment. To be the best in the business Bishop has given everything to realising professional perfection, the last and only attachment in his life is to his mentor and friend Harry (Donald Sutherland). When Harry is murdered Bishop takes on a self-imposed assignment to kill the murderers, using Harry’s own legacy to avenge his death. Things get complicated when Harry’s son Steve (Ben Foster) emerges with the same vengeful goal and a determination to learn Bishop's trade. Unable to turn his back on Harry’s son, Bishop goes against his vow to always work alone and takes on an apprentice; and when the methodical, detached professional takes on the impulsive, emotional student a deadly partnership is born. But while in pursuit of their ultimate mark, deceptions threaten to surface and those hired to fix problems become the problems themselves.